The WORCESTER PARK Blog :: It's a sign! Lizzie e-mailed me yesterday, with a photo of the window at the 'TV Clinic' in Worcester Park (in response to this recent post, I hasten to add). Firstly, congratulations to Lizzie on joining the elite club of people who wander around Worcester Park taking photos of shop frontages. I was beginning to feel a little lonely freak, but she is now keeping me company (incidentally, I always ensure they are taken at an angle that means I don't take a picture of myself in the reflection - otherwise the public adulation would surely prove too much I would be run out of town by the hoardes of admirers, and would have to seek exile in Cheam). "What do the would be Sherlocks among us spot? The date Dr Watson, the date. The clinic has been shut for at least 18 months if not longer. The poster is inside! Did some one break in just to put it up ? Hey, some community spirit! What do you think?" 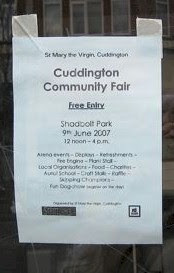 Personally, I love the idea of a militant member of the St Mary the Virgin, Cuddington smashing their way in (with a huge brass candlestick) hell (or heaven) bent on guerilla marketing of their forthcoming tombola. Onward Christian soldiers etc. but I can't quite see that being the case. "My sister thinks the poster in the window is a holy miracle, why didn't we think of that?" Amazing! It is a miracle!! God has indeed spoken to us, via the medium of the TV Clinic. Once the Surrey Comet pick up on this, Worcester Park will become a place of religious pilgrimage, and Broadway Bargains will do a roaring trade in knit-your-own Virgin Mary kits. It's a sign! It's a sign!! No, really folks, it is just a sign.